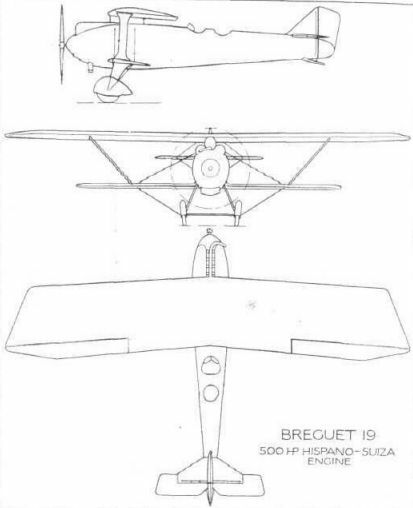 THE FRENCH WORLD TOUR: Sketch Plan and Elevations of the Breguet XIX (Hispano-Suiza) Sesquiplane. ARMSTRONG-SIDDELEY ENGINES IN FRANCE: One of three well-known types of French aeroplanes in which British Armstrong-Siddeley aero-engines have been installed. The Farman "Goliath" - the commercial model - with "Jaguars." 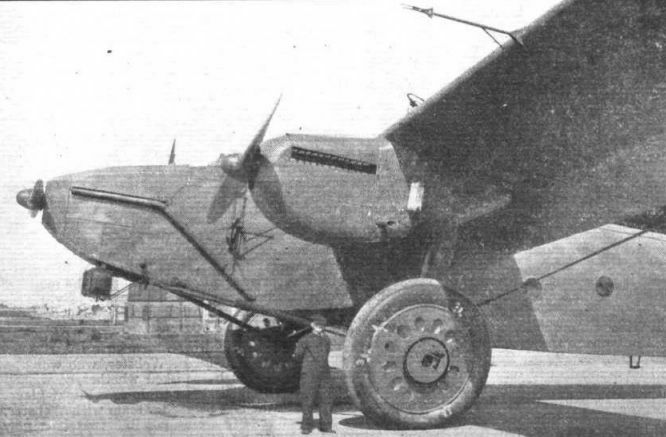 ARMSTRONG-SIDDELEY ENGINES IN FRANCE: One of three well-known types of French aeroplanes in which British Armstrong-Siddeley aero-engines have been installed. The Farman "Goliath" - the military type - with "Jaguars." Recalling Old Times: At the Staaken (Berlin) Easter Meeting, Herr Antonius Raab flew a Bleriot Cross-Channel type of monoplane. 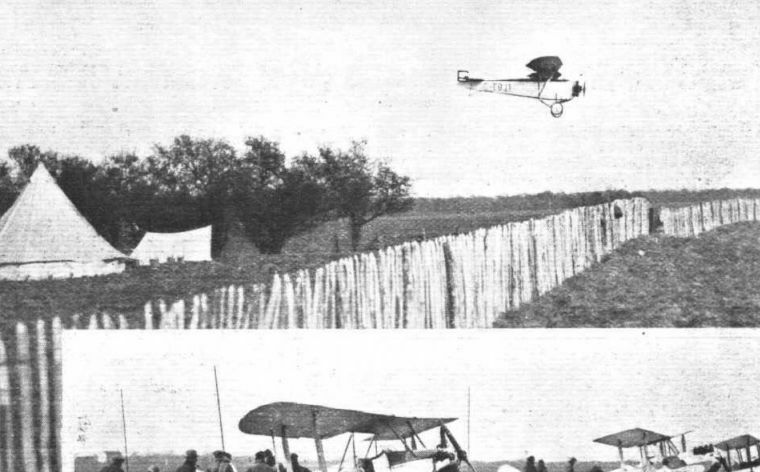 THE SUFFOLK CLUB'S DISPLAY: A most interesting machine which visited Hadleigh was Pilot Officer T. H. Carr's private machine, a B.E.2e, G-EANW, here seen doing crazy flying before the crowd. It was subjected to considerable inspection by the pilots, many of whom could recall their first flights on the B.E. machines during the war. 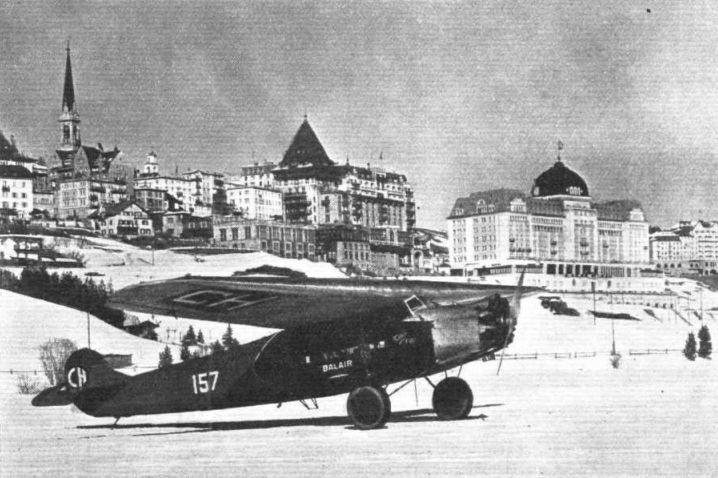 Flying at St. Moritz: One of the Fokker F.VII. (Bristol "Jupiter") monoplanes of the Balair Luftverkehr A.G. ("Balair") , which operates air services in Switzerland, on the Lake of St. Moritz. The Balair Company recently organised joy rides at St. Moritz with the machine shown here. MANOEUVRABILITY: A de Havilland "Cirrus-Moth" piloted by Capt. 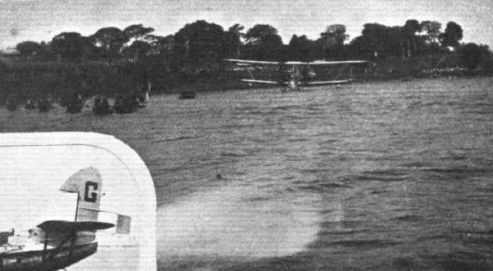 C. D. Barnard, "bombing" a "Chris Craft" motor boat, piloted by Mr. Arthur Bray. The scene of the duel was the Welsh Harp, and both pilots threw their craft about in a most spectacular fashion. JOY-RIDING AT HADLEIGH: Much to the satisfaction of the Suffolk Club, the public clamoured for joy-rides at 5s. per flight; in fact, although the numerous visiting pilots gave their services generously, it was found impossible to satisfy all demands. Without a doubt, Capt. "Jerry" Shaw did as much joy-riding work as anyone. 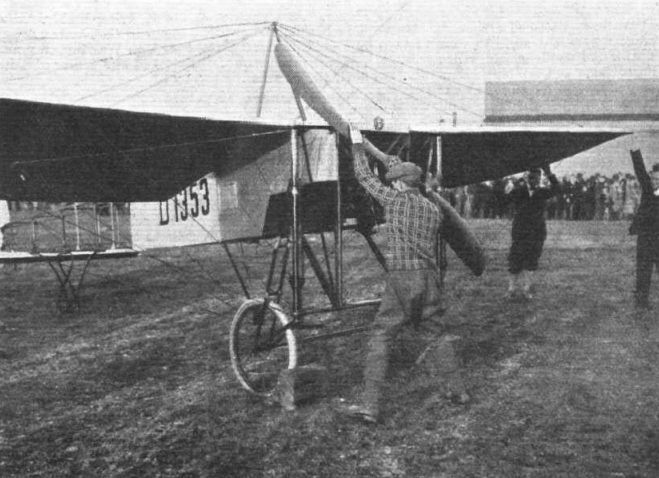 His golden D.H. "Moth" named "Arom," which he flies for the Shell-Mex Company, here seen taking off just over the corner of the aerodrome, where the joy-riders were waiting, was in the air all day. Inset, shows Capt. 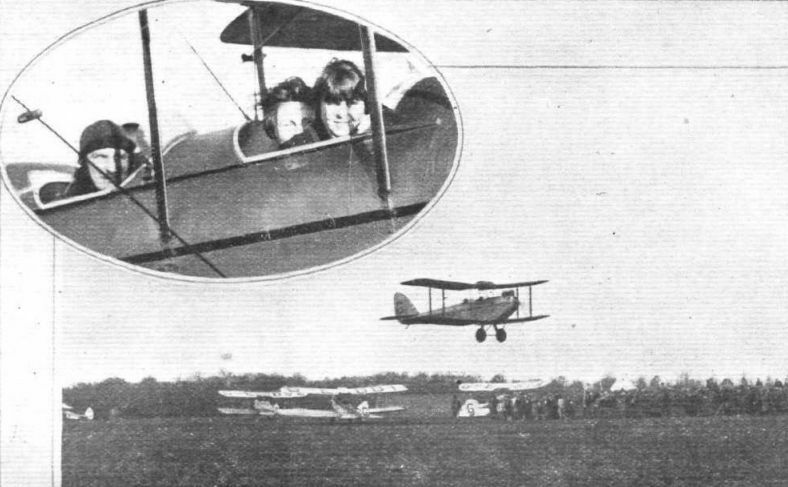 Shaw with two little girl passengers whom he took up at the Lympne meeting on the preceding day. 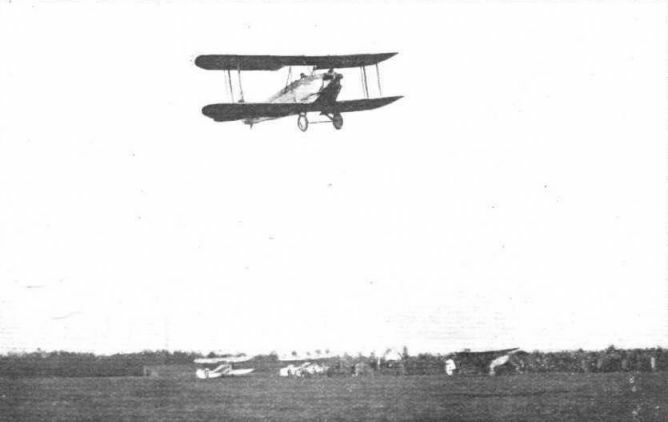 Lady Heath's Avro "Avian" (Cirrus) and Lt. R. Bentley's D.H. "Moth" (Cirrus) (on photo) at Broken Hill during the combined flight through Africa. SLOTS AND "MOTHS": Squadron-Leader England is starting shortly on a demonstration tour of the Continent, and will use a "Moth" fitted with Handley Page automatic slots. 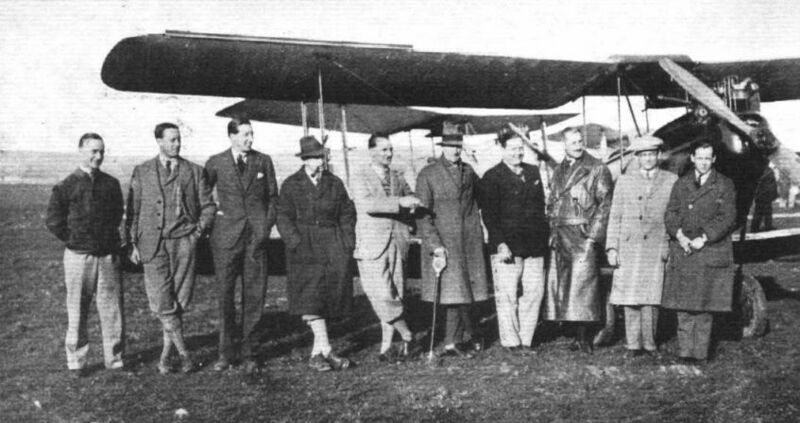 "MOTH'ERS" AT LYMPNE: A group of "Moth" pilots in front of Mr. Nigel Norman's machine, the first privately-owned aeroplane to be fitted with automatic slots. From left to right: Mr. Norman Jones (WI), Mr. Muntz, Mr. Norman (WY), Sq. Ldr. England (WS), Capt. 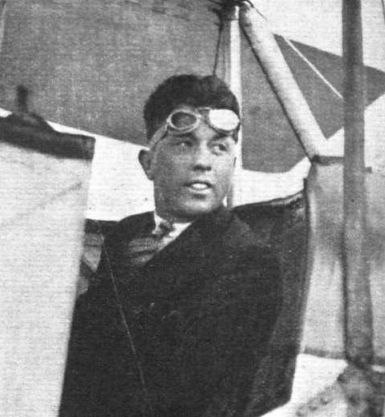 "Jerry" Shaw (QE), Capt. de Havilland, the father of all "Moth'ers" (PU), Mr. Malcolm (NO), Mr. Burt, Mr. Irving (of parachute fame), and Capt. Broad. 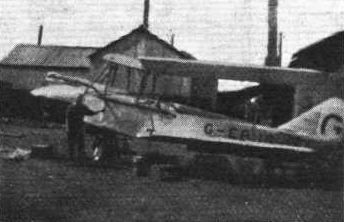 OUT AGAIN: The de Havilland "Moth" fitted with Handley Page automatic slots, was in dock but a very few days after its recent argument with the ground. It is here seen flying again, piloted by Capt. Hubert Broad. 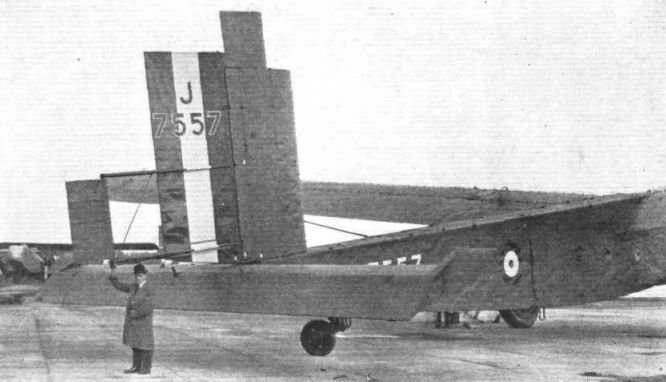 THE PARNALL "IMP": Three-Quarter rear view. Note that both cockpits are clear of the top trailing edge, and that thus the view is very good. THE PARNALL "IMP": Rear view. The raked inter-plane struts transmit the lift from the top plane to the lower, cantilever, wing. Ailerons run the whole span of the bottom plane. 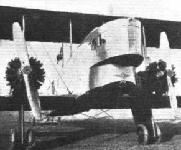 THE PARNALL "IMP": Front view. The engine is an Armstrong-Siddeley "Genet." 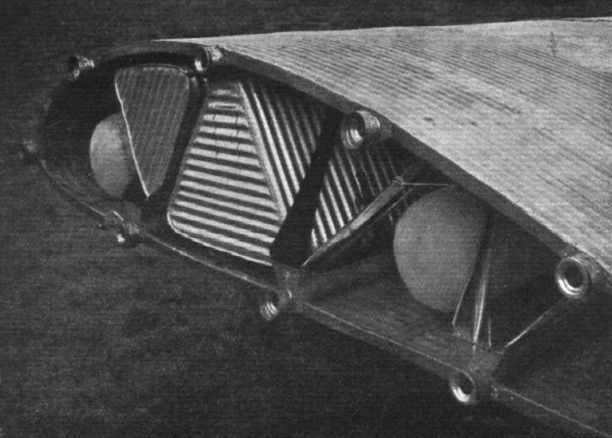 By removing the top plane, cabane and struts, the machine can be converted into a low-wing, cantilever monoplane. 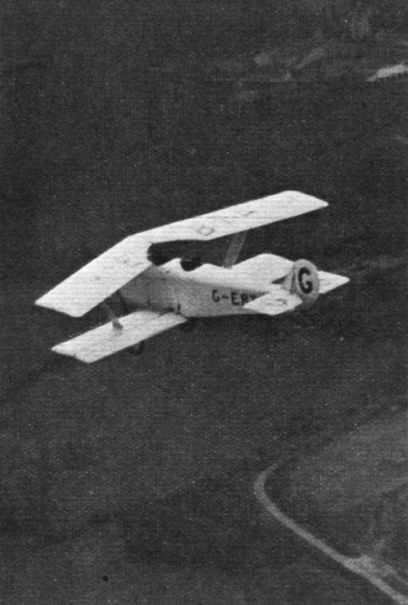 THE PARNALL "IMP" WITH ARMSTRONG-SIDDELEY "GENET" ENGINE: This aerial view, taken from a "Moth" kindly lent by the Wessex Club and piloted by Mr. Bartlett, the Club Instructor, gives a good idea of the unusual arrangement of the wings. On this occasion the "Imp" was piloted by Mr. Harold Bolas, its designer. 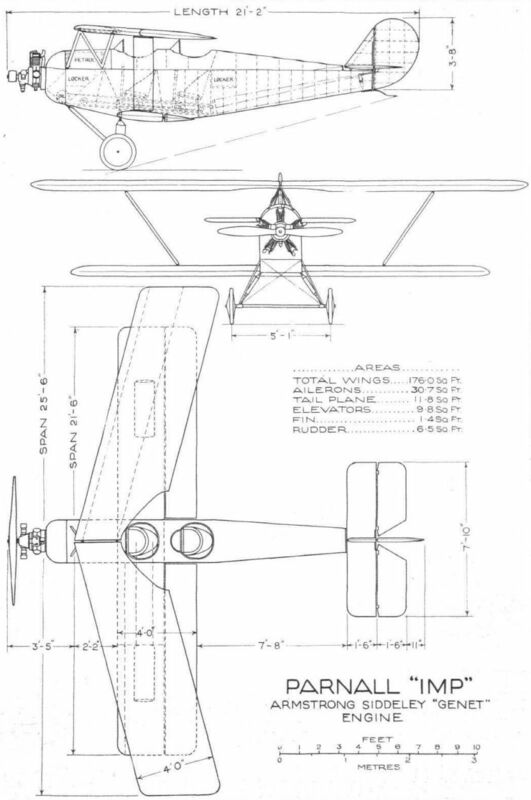 THE PARNALL "IMP" LIGHT AEROPLANE: Some Constructional Details. The engine plate is supported on a system of square tubes and angle sections, as shown in 1. The quick-release attachment of the aileron controls is shown in 2, while 3 illustrates the attachment of the interplane struts to lower plane. The same sketch also shows the general construction of the strut. 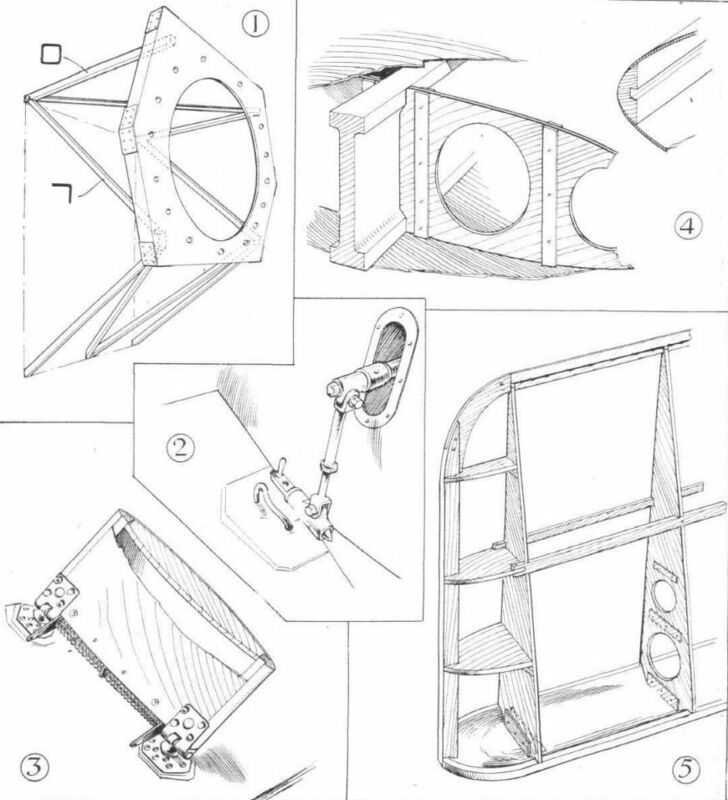 The wing construction, consisting of false spars or stringers, and ribs or formers, with spruce planking, is indicated in 4, and the aileron and elevator construction in 5. AT THE LYMPNE EASTER MEETING: Dr. Whitehead-Reid coming in to land on his Westland "Widgeon II" with "Genet" engine. A "close-up" of the nose of Wing-Commander Manning's Westland "Widgeon III" revealing that well-tried combination the A.D.C. "Cirrus Mk.II" engine and the Fairey metal airscrew. FLYING TO AUSTRALIA: This is the Westland "Widgeon III" fitted with the A.D.C. "Cirrus Mk. II" 30/80 h.p. engine which is being flown to Australia from England by its owner, Wing-Commander E. R. Manning. He reached Marseilles from Lympne with one stop at Lyons on the first day, April 23. EASTER AT HADLEIGH: Here are seen the light aeroplanes parading past the crowd on Monday afternoon. Two Westland "Widgeons'' are leading and the Blackburn "Bluebird" is following up. The public was able to make a thorough study of all the light aeroplane types at present on the market, for each type was represented in numbers. 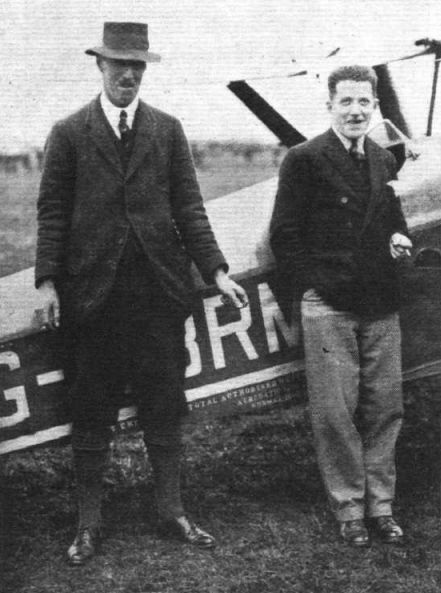 PERSONALITIES AT HADLEIGH: Mr. R. G. Cazalet and Flt.-Lt. Rose, who won the "On To Hadleigh" Rally in the former's Westland "Widgeon." THE GERMAN ATLANTIC FLIGHT: Filling up the "Bremen" with fuel 45-hour flight. The German Atlantic Flight: One of the wings of the ''Bremen,'' showing the extra petrol tanks and the flotation bags. 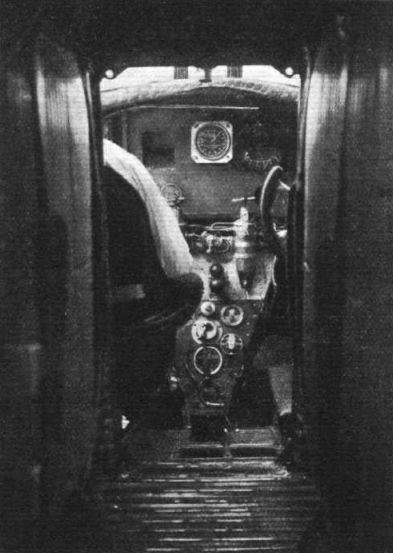 THE GERMAN ATLANTIC FLIGHT: View inside the fuselage of the "Bremen," showing the main petrol tanks (at sides) and the pilots' controls. Additional petrol was carried in tanks situated within the wings of the machine. THE AFRICAN SURVEY FLIGHT: "Snap" taken en route to the Cape: The Short "Singapore" (Rolls-Royce "Condor") refuelling with Shell. THE AFRICAN SURVEY FLIGHT: "Snap" taken en route to the Cape: An "attack" by native war canoes on the Short "Singapore" on Lake Victoria, taken while a film was being "shot" by Mr. Bonnett, the cinematographer of the expedition. Visitors to the Lympne Meeting: Mr. and Mrs. F.P.Raynham, with their "Avian," which Mr. Raynham has bought for photographic survey work. Capt. H. A. Brown has now joined Avro's "Avian" sales department as demonstrator, and is also the firm's test pilot. 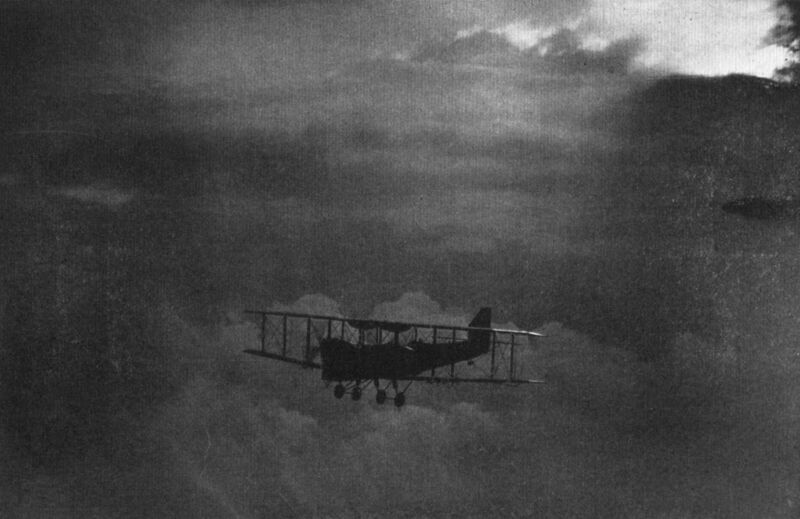 Lady Heath's Avro "Avian" (Cirrus) (on photo) and Lt. R. Bentley's D.H. "Moth" (Cirrus) at Broken Hill during the combined flight through Africa. 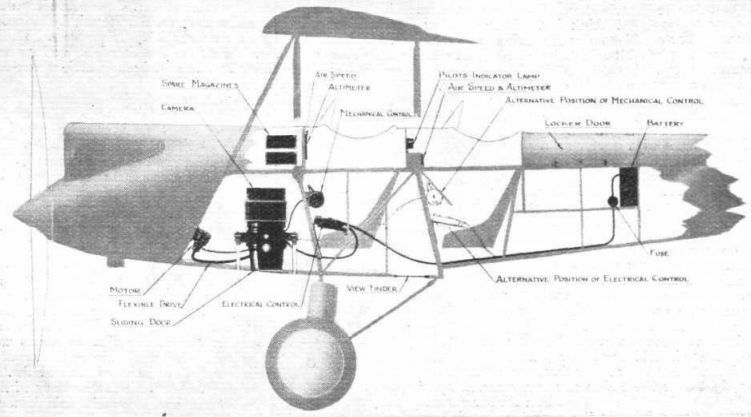 AN AVRO "AVIAN" FOR AIR SURVEY: This diagram shows the installation of the Vickers "Eagle" aerial camera in the Avro "Avian III," one of which has been supplied to Mr. F. P. Raynham. Suffolk Club's Air Race: There was a good race for the Suffolk Handicap over a course of 21 miles on Monday afternoon. Five machines entered, and in this picture we see the Blackburn "Bluebird," flown by Capt. Blake, getting well away 2 mins. 22 secs, after Miss Spooner, who won the race. Capt. Blake unfortunately got confused with the turning points and, therefore, came in fourth. 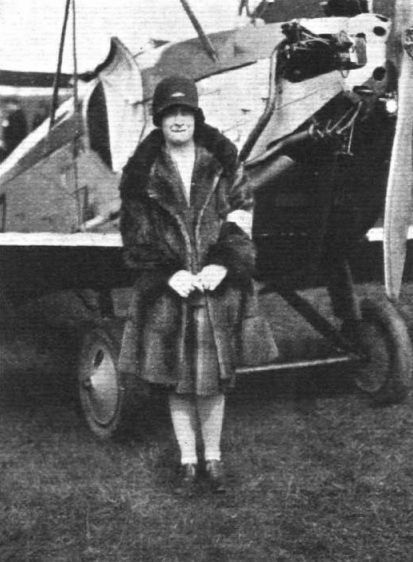 PERSONALITIES AT HADLEIGH: Miss Sylvia Edwards, the Club's first lady soloist, who demonstrated the Blackburn "Bluebird." 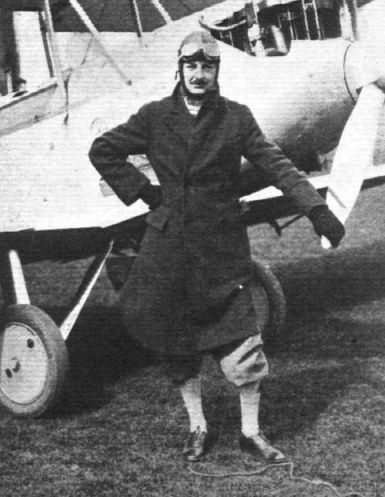 A CELEBRITY AT HADLEIGH: The crowd at the Hadleigh Air Meeting was pleased by the presence of Flt.-Lt. S. N. Webster, the winner of the last Schneider Trophy, who visited the aerodrome both days. He helped the Suffolk Club most effectively by doing joyriding in the Blackburn "Bluebird." For the honour of accompanying him the public paid double the normal charge. 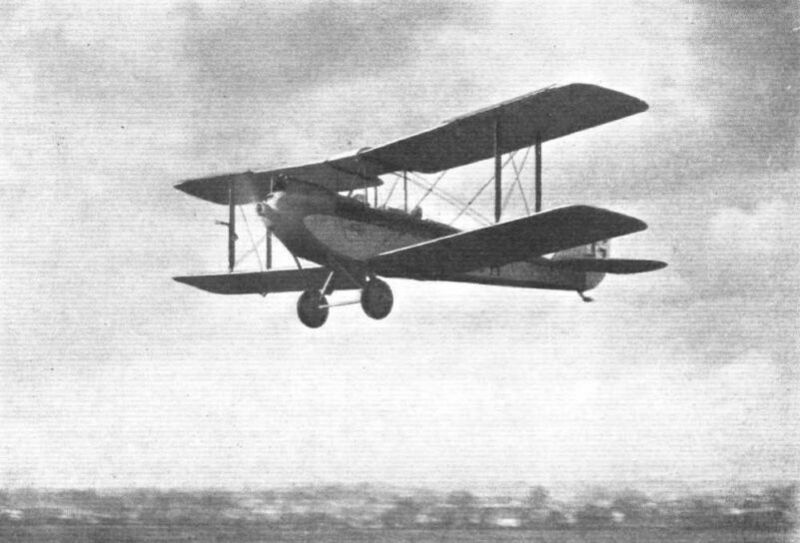 AT OPPOSITE ENDS OF THE SCALE: A Handley Page "Hyderabad" and a de Havilland "Moth," both fitted with Handley Page automatic slots. These two machines represent the largest and the smallest to be so equipped up to the present. 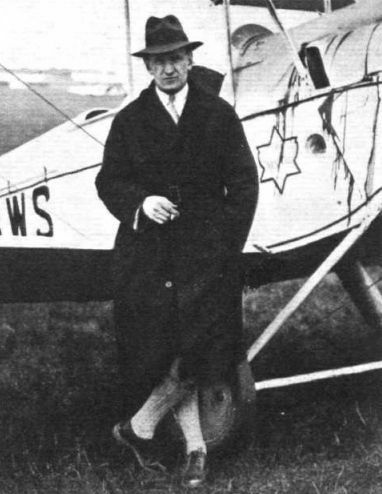 A LITTLE COMIC RELIEF: Mr. Cousins caused much amusement by arriving in a D.H. 53, wearing a bowler hat, which he raised as he flew past the enclosures. On the right he is seen with attache case and umbrella after alighting. 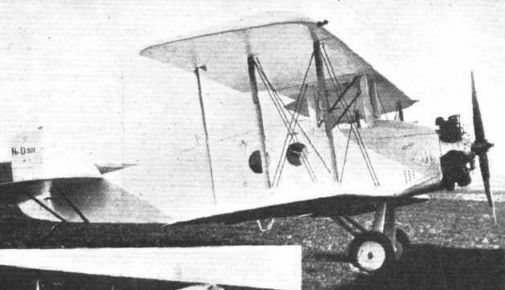 A RECENT AMERICAN BOMBER: The Keystone (Huff-Daland) XLB-6, fitted with two 500 h.p. Wright "Cyclone" air-cooled radial engines. 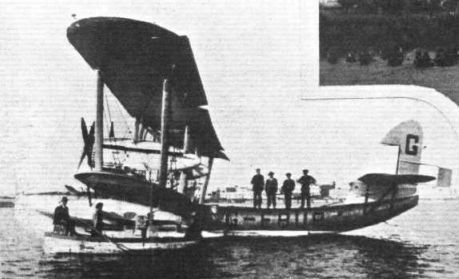 It is similar to the "Pirate" (400 "Liberty") produced some while back by the Keystone firm, and is a development of the "Pegasus" and the "Cyclops". 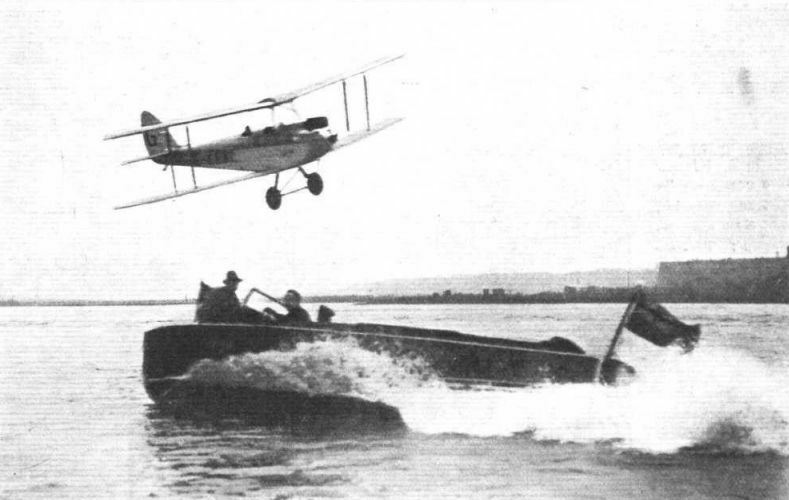 The Great Flying-Boat Cruise: One of the four R.A.F. Supermarine "Southampton" metal flying-boats - each with two Napier "Lions" which, under the command of Group Capt. H. M. Cave-Browne-Cave, are flying to Australia. ARMSTRONG-SIDDELEY ENGINES IN FRANCE: One of three well-known types of French aeroplanes in which British Armstrong-Siddeley aero-engines have been installed. 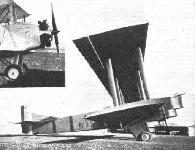 The Nieuport-Delage type 391 transport machine, fitted with the 200-225 h.p. "Lynx." 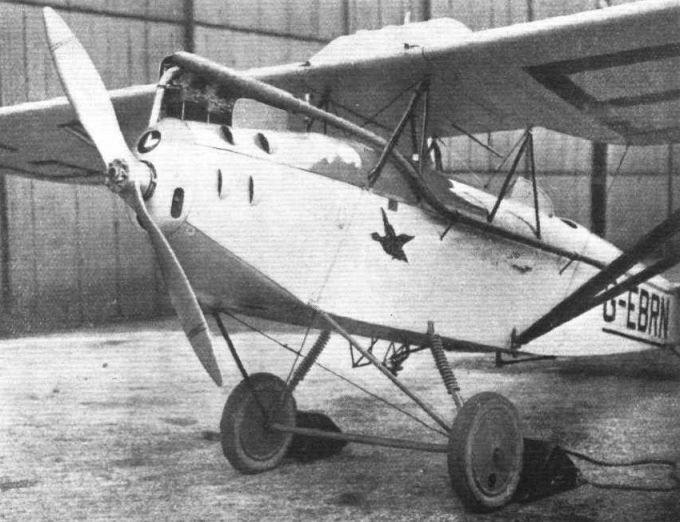 A SWISS LIGHT 'PLANE: Three-quarter front view of the "Korsa I" monoplane, which is fitted with a 60 h.p. Anzani engine. 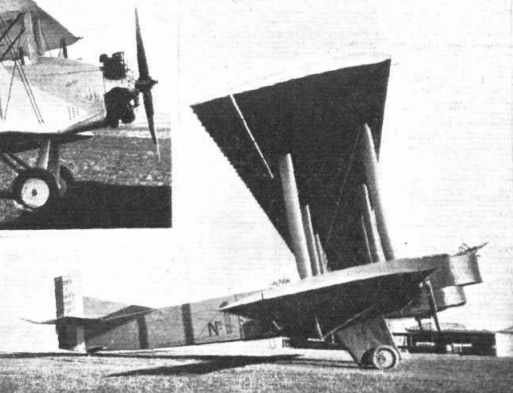 A SWISS LIGHT 'PLANE: Side view of the "Korsa I" monoplane, which is of the totally enclosed cabin type.